Subaru has announced the launch of the 2014 Subaru XV Crosstrek Black, a new limited edition variant of the manufacturer’s popular compact crossover. Black is beautiful and will be an exclusive exterior finish on the new exclusive 2014 Subaru Black XV LImited Edition model. Subaru has just launched a new XV Black that is exclusive and unique in the UK market. The new exclusive limited edition XV will get special treatments inside and out to set it apart for off-road going buyers. But it may be hard to keep clean as many Subaru XV fans will want to take this beauty off-road. In the UK, Subaru offers both the 2.0-liter Boxer petrol and diesel powertrains. They will come mated to a six-speed manual transmission, or the Lineartronic automatic transmission. It will feature Subaru’s excellent Symmetrical all-wheel-drive and extra ground clearance on the XV. It may require extra car washes after a day off-road with the beautiful exterior black finish. Outside the new Black XV LImited Edition will be finished in Crystal Black Silica exclusive paint. And it gets more visual additions unique to the special edition model like front, rear and side silver-resin underguards and front and rear mudflaps. These should keep the underside safe from rocks and the paint free of rock and gravel chips. Inside, the XV Black edition will feature a unique cargo step panel and a foldable cargo tray. It will also be fitted with heavy-duty rubber floor mats. The new XV Black Limited Edition will also come with standard 17-inch alloy wheels, daytime running lights, heated front seats, wiper de-icers, cruise control, folding door mirrors, dual-zone air-conditioning, rear view safety camera, Bluetooth, HID headlamps, and rear privacy glass. Last year, the 2013 Subaru XV was named ‘SUV of the Year’ by UK’s 4x4 Magazine. The industry-leading 4x4 Magazine put the XV through its paces, both on- and off-road before being crowned the class winner in one of the hardest-fought categories in a special ‘4x4 of the Year’ issue. The small crossover SUV market has expanded rapidly in the last few years and the XV beat out popular rivals from Audi, Kia, Mazda, Nissan and Volkswagen. 4x4 Magazine placed Subaru’s latest All-Wheel Drive model ahead of all of them. The new XV Black should be a big hit with UK buyers and will offer more value. It will be priced from 24,495 British Pounds (on-the-road) for the 2.0i Lineartronic and 24,995 for the 2.0 Boxer diesel, and is based on the existing SE model. UK buyers will pay just 1,000 for all the extras fitted as standard to the XV Black, and if fitted separately as options to other models in the range, would total over 1,600. 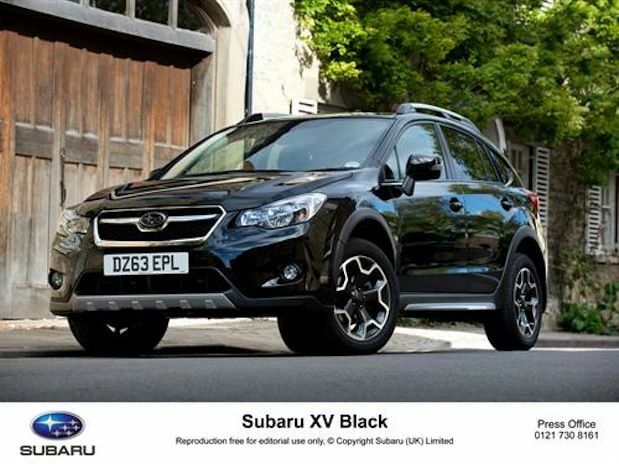 The all-new 2014 Subaru Black XV LImited Edition model will arrive in UK showrooms soon.